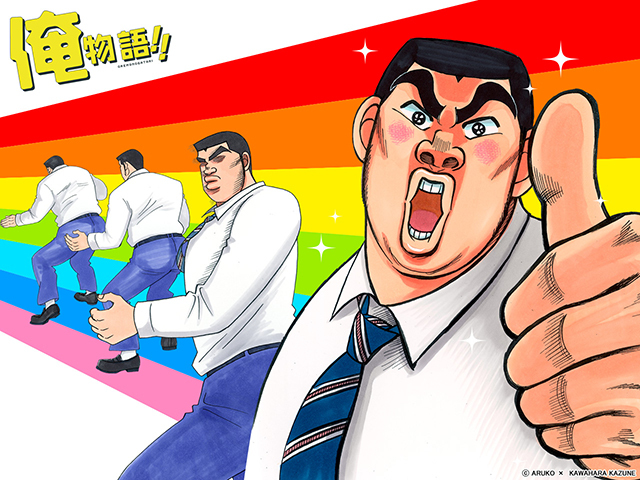 One of my favorite shows of the new season has been Ore Monogatari! !, which runs as My Love Story!! here in the US. It’s not especially original or innovative, and that’s kind of the point. In a medium that so often relies on gimmicks and melodrama to sell romantic stories, it has the guts to just tell a story. In three episodes, with just three characters, it’s managed to outdo a huge portion of the genre. That’s pretty impressive, and it’s worth examining why this series works as well as it does. For a start, it has characters the audience can actually like and relate to. No one has amnesia, no one’s tangled up in a twisted web of relationships, and no one’s an intolerable mix of passion and jealousy. There’s a big, goofy guy, his levelheaded best friend, and a nice girl who the big guy mistakenly thinks has a crush on his friend. Takeo, Suna, and Yamato are all entertaining on their own, and their personalities play nicely off of one another. The dramatic tension doesn’t come from wanting the protagonist to choose the good romantic interest over the bad one. Instead, it comes from wanting all of the characters to find the happiness that they want for each other. If it were possible to hug a work of fiction, I would. What’s interesting to me is how My Love Story!! seems to have a fairly broad appeal. A lot of it seems to come down to Takeo’s strength as a main character. On one hand, he’s very much a guy’s guy: the kind of person you’d want to be friends with. He acts and thinks in ways that make it hard not to root for him. On the other hand, he’s not the same generic nice guy character that plagues the romantic comedy genre. There’s an actual, complex person behind that ridiculous face, and that’s the sort of thing that makes a character compelling no matter who’s in the audience. Of course, it helps that the series is also damn funny. Takeo’s outlandish expressions are the main draw, but the writing is also very strong. Suna’s deadpan reactions to the other characters add another layer of humor and help to keep the story grounded. Yamato is an adorable mess, and her nervous energy is practically tailor-made to be paired up with Takeo’s intensity. There’s such a good comedic balance within this core trio that I’m almost afraid to see what will happen as the story develops and the cast presumably expands. That’s really about all there is to it. Assemble some believable characters and tell their story with a good sense of humor, and you’ve got something worthwhile. Sometimes we need a series like My Love Story!! to remind us of that. This Week in Anime is hastily cobbled together by Paul Jensen. You can follow his ramblings about anime and manga on Twitter.